A.R.O. -Aspect Ratio Optimization - Apco Aviation Ltd.
Why does APCO change aspect ratio for different sizes of same wing model? Indeed it does sound odd. Why should APCO insist on sizing system which is not popular with other manufacturers? Let’s see – to every problem there is always more than one solution and probably you can reach the goal either way. The question is what is more efficient and offers better optimization. The span of the wing and size are changed by adding or deducting the amount of panels (wing segments). This is In order to not only change the area of the wing, but also the Aspect Ratio (A.R)! This way we reach a better result as the change in A.R compensates for many other variables. 1. The drag produced by pilot stays about the same through all sizes. 4. Reynolds numbers are not scaled As the Air’s density and Viscosity stay unchanged. As a result when zooming, many times manufacturers have difficulties repeating handling and safety of the wing in all sizes! It is well known that small sizes when zoomed behave more aggressively, leading to certification difficulties in the same class. Therefore smaller wing sizes designed by APCO with lower aspect ratio and larger sizes allow to build in higher aspect which can improve performance where possible without being aggressive. To be systematic, we at APCO on most of the wings during R&D evaluate both approaches (classic zooming and A.R.O.) and judge the final, practical result, choosing the best. In case, as happened with Karma EVO, we achieved better result by traditional zooming – which is why we launched a glider which is zoomed and maintains same aspect ratio between S and M sizes. We did finish the design and successfully certified the Karma EVO in S and M sizes for both versions – (zoomed, with constant Aspect Ratio and APCO’s A.R.O. applied) . In the end we chose the better one – in this case the zoomed version. 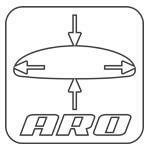 In the same way when you have a wing which in our opinion gives an optimal result by using our A.R.O. system – then that is the system we use and that is the case with most of our gliders. Also on very high aspect ratio wings – e.g. Enigma or Zefira we favor traditional approach by zooming, maintaining the same aspect ratio on each size, as on high aspect ratio wings the difference in span is too big between different sizes if we change the size by changing the span. As you can see, we are choosing the best sizing system for each particular wing design be it A.R.O. or classic zooming. We hope this explanation helps to explain the reason behind our approach.